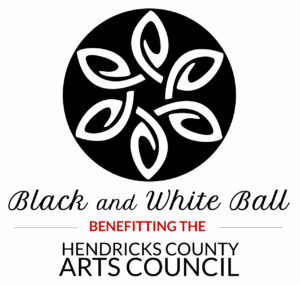 Ring in the new year in style and support local arts at the 2018 Black And White Ball, held at the Hendricks County 4-H fairgrounds on New Year’s Eve. Proceeds will benefit artists and arts organizations in Hendricks County. Doors to the Black And White Ball open at 8 p.m. Enjoy heavy hors d’oeuvres and sweets, a full cash bar, dancing, entertainment, prizes, a champagne toast at midnight, and lots of ART! Black and white formal attire is encouraged. Click the link below to purchase tickets to the 2018 Black And White Ball. You may select the number of tickets you want to purchase on the next page. Tickets purchased before December 23 will be mailed to you. Tickets purchased after December 23 will be available at will-call. Thank you for your interest in becoming a part of the Hendricks County Arts Council!